One of the newest additions in Zato 3.1 are MongDB connections - learn in this article how to create and use them in your Python API services. As with most parts of Zato, the most straightforward way to create a new connection definition is to fill out a form in web-admin. 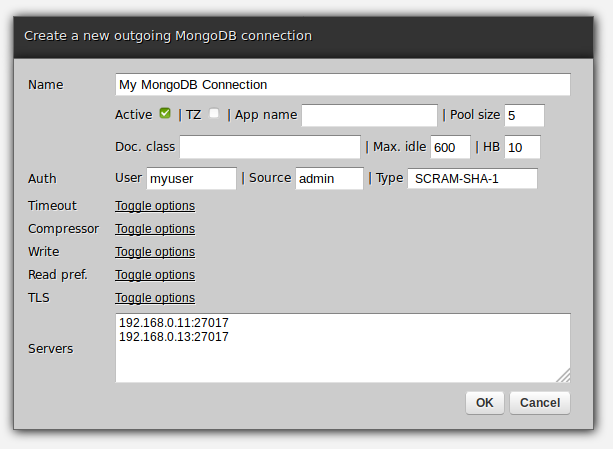 Note that MongoDB connections pack in a lot of options and, to keep the user interface as lightweight as possible, only the most commonly used ones are displayed in the default view and the rest needs to be toggled as needed. To confirm that the connection is configured correctly, including credentials to connect with, you can ping it. If everything is set up correctly, a response such as the one below will be returned. A sample Python service may look like below - the client returned by self.out.mongodb is an instance of pymongo.MongoClient so anything that the PyMongo library can do is achievable from Zato too. This is everything that is required - once a connection is created it can be used immediately in Zato services. Because each connection is actually an instance of the official MongoDB Python client, there are no limits to what can be done with them - building MongoDB-based applications with Zato is now a fully supported possibility.